Are you thinking about adding on to your backyard this spring? If you are, it makes sense to give us a call early to discuss ideas for your backyard upgrade. In addition, you might want to consider entering our Dream Backyard Makeover Contest. Archadeck is sponsoring a backyard makeover contest where one lucky recipient will win a backyard makeover worth up to $70,000. This contest is co-sponsored by Archadeck partners TimberTech and Belgard. In order to enter, you simply visit our Archadeck of Kansas City facebook page and click on the blue “Win a Backyard” contest button. You can also get to the page by clicking on this direct link to the contest. When you get to the page, you will need to provide your name, contact information, post an image and enter a 250 word description of your dream backyard. The contest is open for submissions through April 22, 2013. Dreaming up the perfect backyard may be more difficult than it seems. Here are some ideas. You might want to consider adding a porch. This can be an open porch, a screened porch or a porch with vinyl windows to allow use of your room for more time throughout the year. 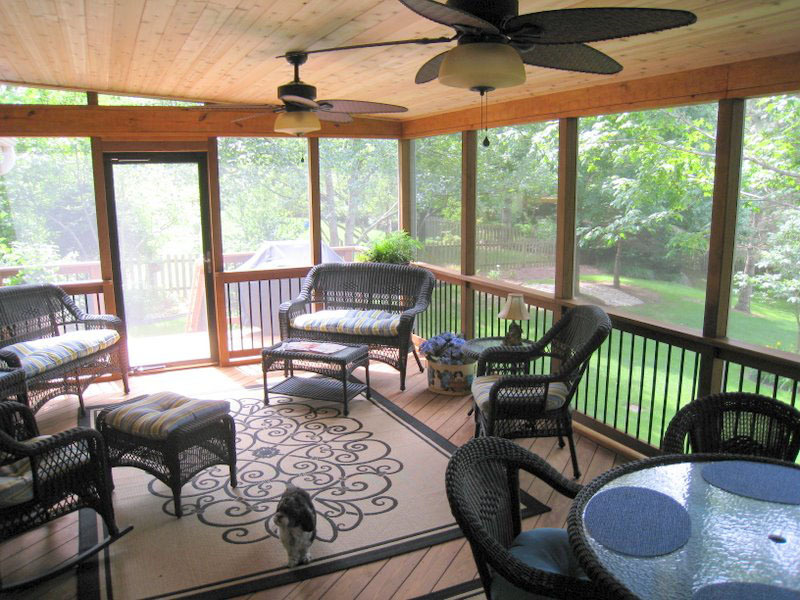 Your porch could then open up to a composite deck using TimberTech. To add to those 2 outdoor living spaces, you could also add a Belgard paver patio for a third outdoor living space. Combination outdoor living spaces are very popular whether you add them at one time or whether you have a multi-year staged home addition plan. Consider some enhancements to both your deck and patio. For your deck, enhancements can include a bump-out section for your grill. It could also include built-in benches or planters. You might want to consider a metal railing. Enhancements to a paver patio might include a seating wall, retaining wall, built in pillars or columns, or even decorative features such as using an alternate color or paver for your patio outline. There will only be one lucky winner nationwide so if you’re thinking about backyard upgrades, give us a call for a free consultation at (913) 851 – 3325. We look forward to your call. This entry was posted in Backyard makeover and tagged Archadeck dream backyard makeover, Archadeck of Kansas City, Kansas City porch builder, Kansas City screened porches on February 26, 2013 by archadeckkansascity. 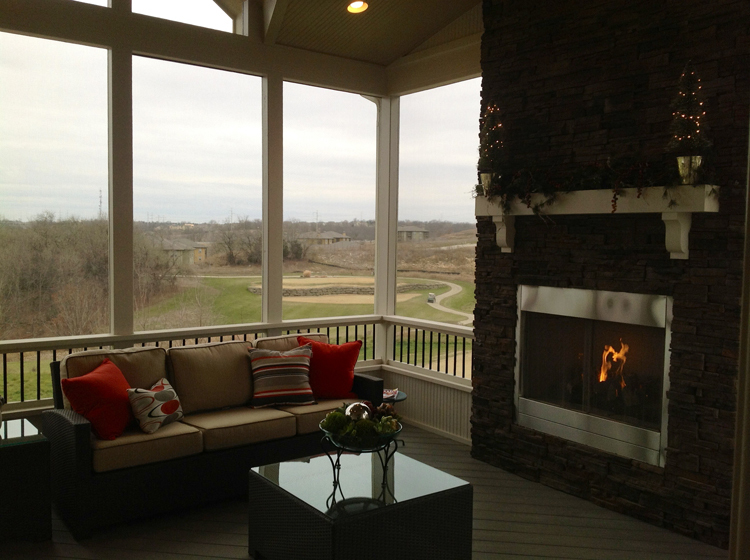 How do you make your new screened porch look original to your home? There are several factors that go into selecting the best design and architectural features to make your new porch or other outdoor structure look original to your home. Take a look at the photo below. You almost need to look at it for a few minutes to recognize that it’s the same home. 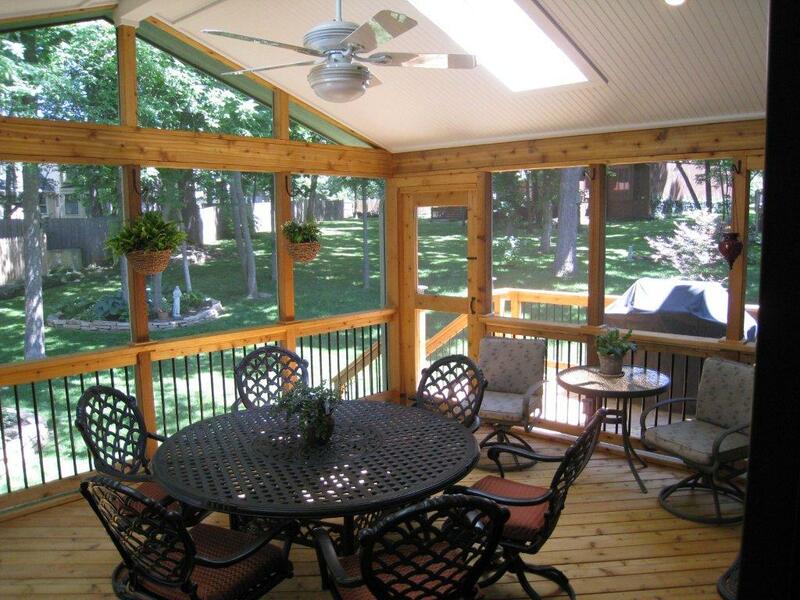 The new screened porch was designed to work with the home and to look like it’s original to the home. Here are some of the ways we make the new structure look original to the home. From an architectural perspective, one of the first key factors is evaluating the correct roofline for the addition. This house had multiple rooflines as is often typical of custom homes. In our design, we came up with a roof that complimented the home and one that worked in durability, drainage, size, and shape. This home has both gable roof lines and hip roof lines. Our new porch incorporated a gable peak into the roof to blend the porch perfectly with the architecture of the home. Because this project was very high in the air – 13 or 14 ft, and the roof is well over 27’ or 28’, it was important to take into account how the height reflects the scale because things look different at that height than from the ground. Height does affect scale and this was an important consideration with the design. In order to compliment the house, the homeowner agreed we needed something other than ceiling and screens. We felt we needed kneewall to blend into the house. We used half kneewall and half railing. That lends to the architectural look on the outside as well as on the inside. In the picture above, the area between the supporting posts and the screen is the interior kneewall of the porch. The picture to the left shows how this combination kneewall and railing looks. 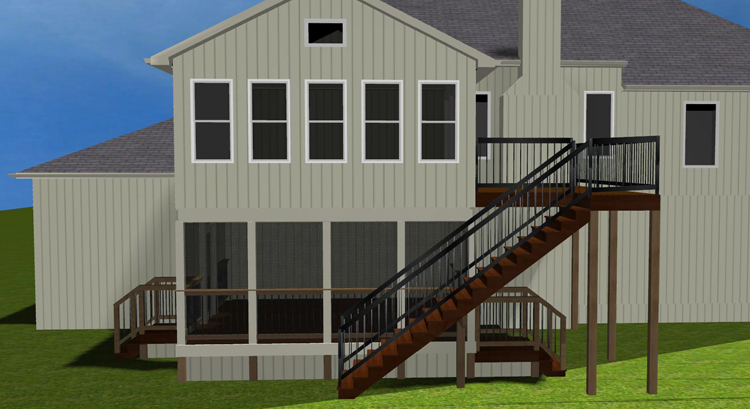 The railing has Deckorator balusters and a custom built cedar railing. This particular porch has a beautiful custom fireplace integrated into the porch which allows the homeowners to enjoy their screened porch a little longer throughout the year. 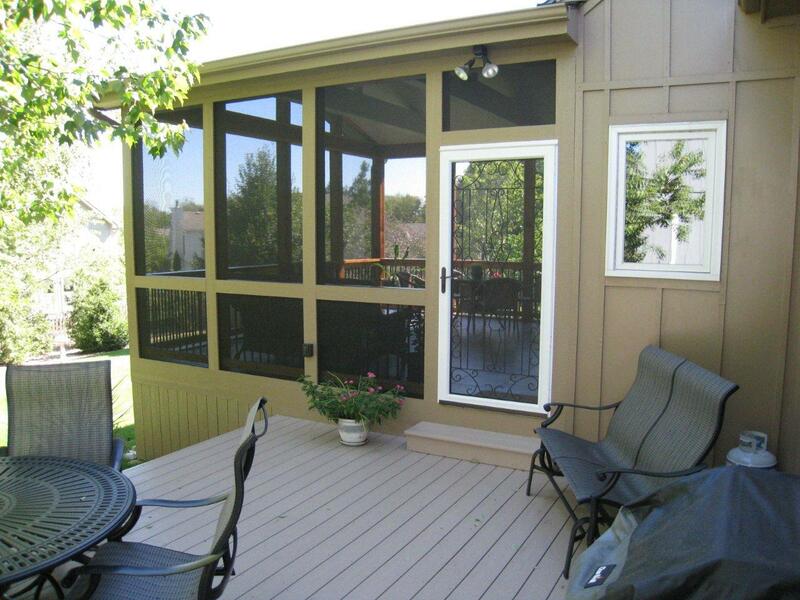 The screened porch exterior has custom siding trim and is painted to match the exterior of the home. All of these elements such as roof design, scale, trim, color, and kneewall contributed to making this porch look original to the home. 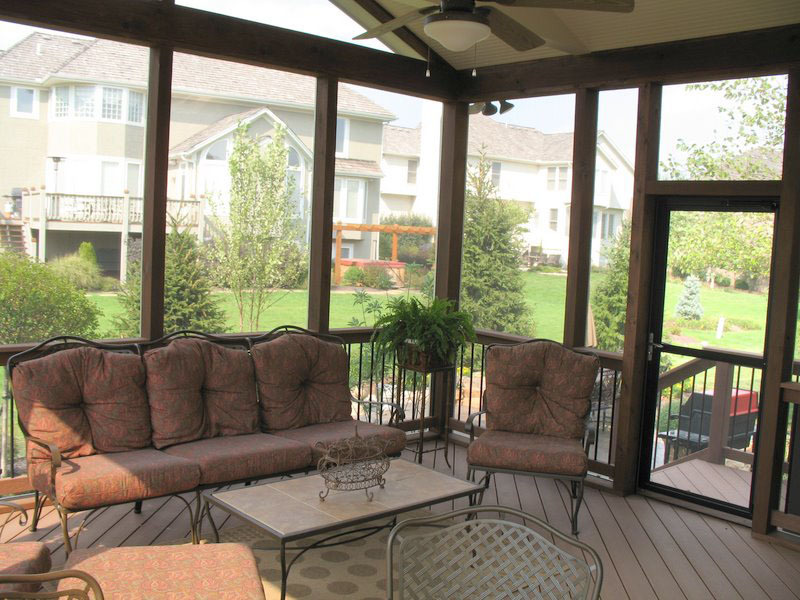 To see more pictures, visit our screened porch photo gallery on our Archadeck of Kansas City website. This entry was posted in Covered porch, Open porch, porches, Screen porch design and tagged Archadeck KC, Archadeck of Kansas City, Kansas City porch builder, Kansas City screened porches on February 5, 2013 by archadeckkansascity. With an interior house room, the floors and walls aren’t typically the hallmark features of the interior design. The design is often created through furniture selection, wall hangings and other things that are added to the room. With a screened porch, the central features of the interior design are often the structural components of the porch itself. 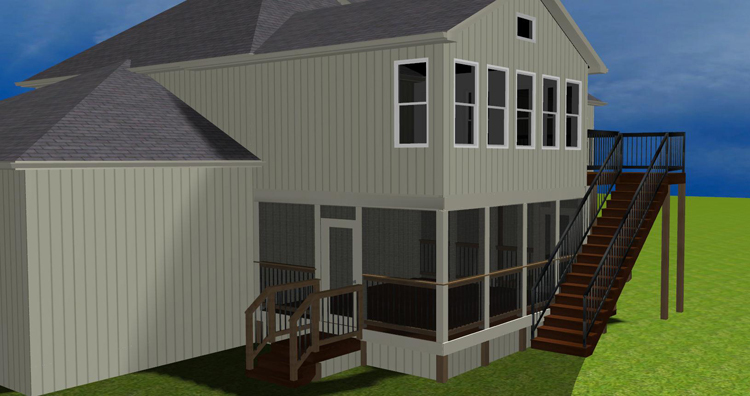 While your porch will be an extension of your home from a living perspective, it will have its own design identity. It will have different flooring, walls, and ceiling than the other rooms of your house. While screened porches of the past may have had a simple exposed wood construction with quite a rustic look, screened porches of today have a myriad of material selections which dramatically affect the finish and thus the interior design of your screened porch. There are many flooring, colors, textures, and products available. We build floors with various types of soft wood and hard wood. We also build porches using composite flooring. Composite is very popular right now followed by wood as a flooring choice. Popular railing selections include wood, metal and composite and these vary by colors, thicknesses, and style. Dark colored metal railings are very popular now because of the visibility they provide. The thin spindles and the dark color encourage your eye to look past the railing into the yard. Although you might not think there are many ceiling choices, in fact they are many including ceiling trim, colors, and type of trim. The ceiling can be painted, stained, wood toned, or white. The traditional classic white ceiling is always popular but some people want more of an outdoorsy cabin style look and might go for wood-toned look. There are structural elements that can be used for architectural emphasis such as beams and trusses. These architectural elements can serve a functional or aesthetic purpose. Although the roof is an exterior component, it has a dramatic effect on the interior. The roof style and height contribute to the feeling of openness. With our customers, more than 99.9% of the ceilings we build are vaulted. Because your roofed structure component choices will be so critical in the overall design of your new room, ask lots of questions of your prospective contractor. Ask about options and the pros and cons of the various options. A good contractor will be patient and enjoy the process of helping you with these selections. Our consultation is free. 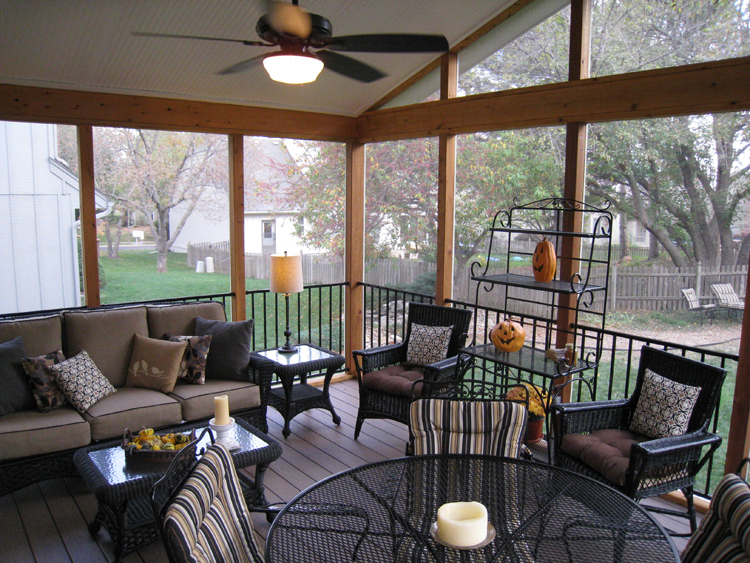 Give us a call today to discuss your ideas for your new Kansas City area porch. This entry was posted in Porch interior design and tagged Archadeck KC, Archadeck of Kansas City, custom screen porches, Kansas City porch builder, Kansas City screen porch interior design, Kansas City screened porches, screen porch Kansas City on October 21, 2012 by archadeckkansascity. 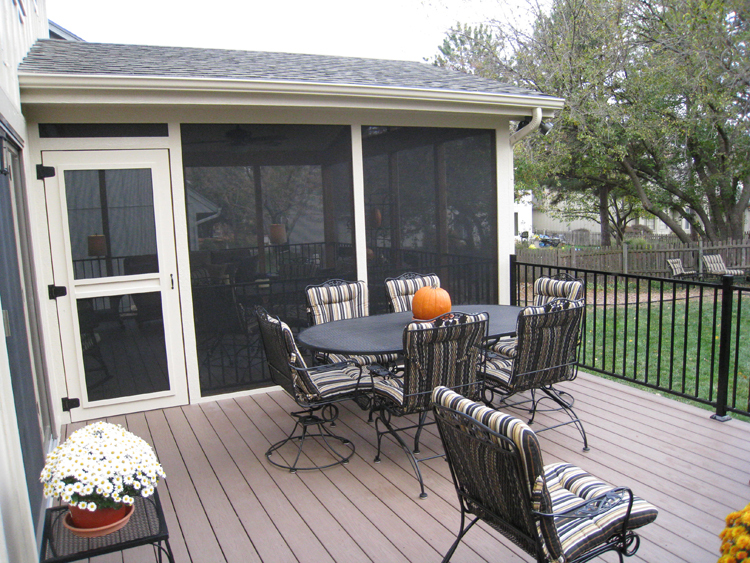 We recently completed a screened porch and deck combination in Overland Park. 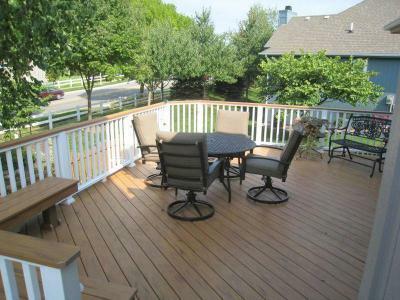 The homeowners had an existing deck but wanted a porch and deck combination. The owners wanted a tile floor on the porch so we had to remove the old deck and install a new foundation suitable for tile. A traditional deck is not able to hold tile. 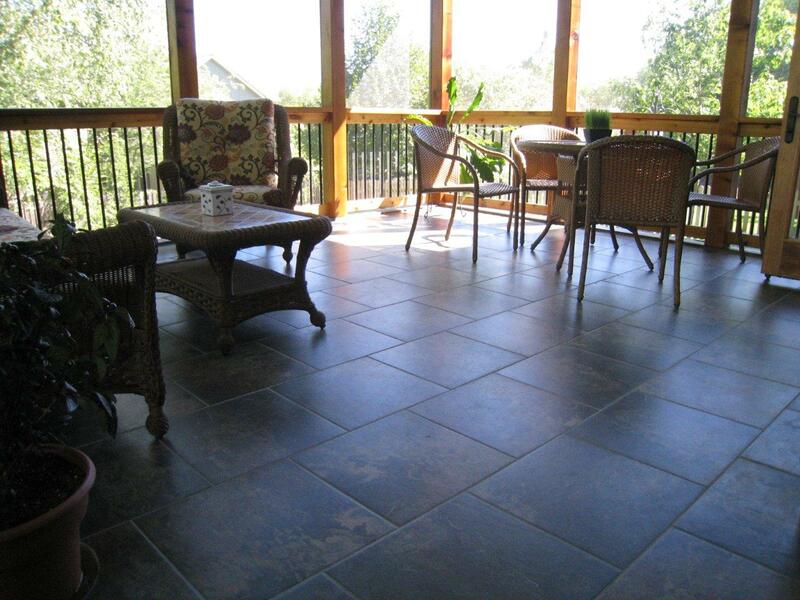 Tile is a unique flooring choice for a screened porch that affords much design flexibility. Additional benefits include tile’s durability and that it’s long lasting, and requires little maintenance. 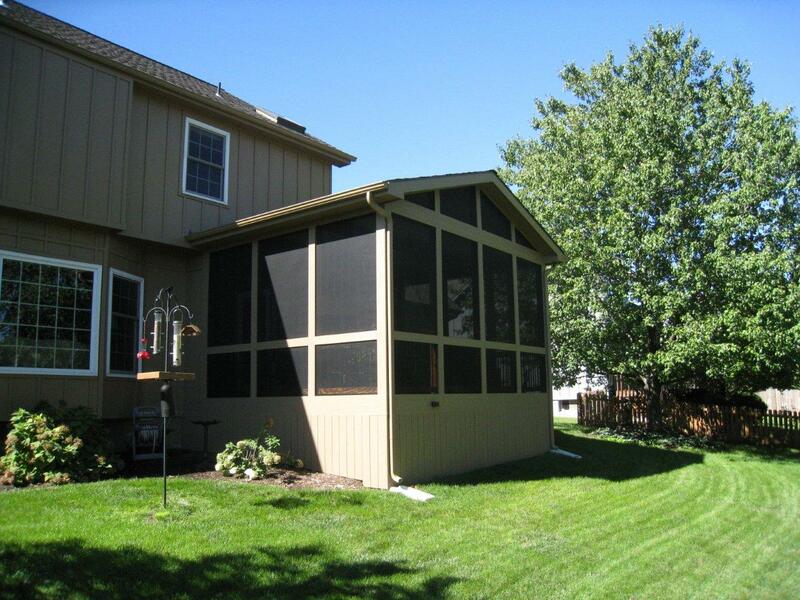 We designed a gable roofed screen porch to attach to house in the area they wanted. The porch has cedar wall posts and a painted bead board ceiling. 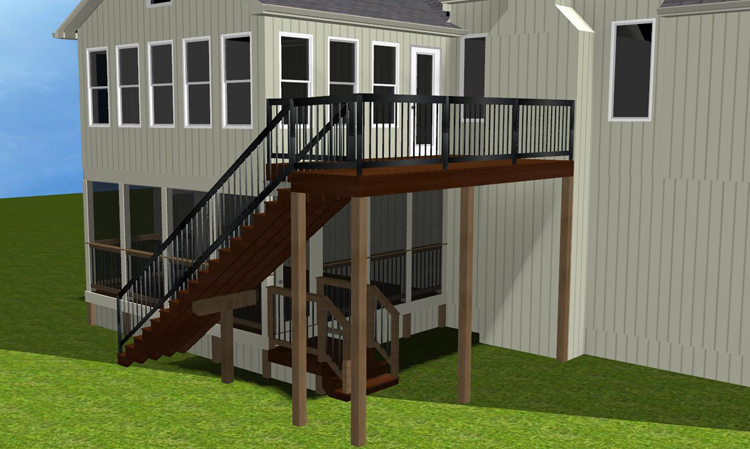 We installed ultra-heavy duty screening and railing on porch with Deckorator metal balusters. The homeowners wanted a new custom door installed in the house. We removed the sliding doors and added French doors instead. The deck is built using AZEK brownstone. Since it’s low to the ground, it does not require railing. We added custom skirting underneath the porch and deck to close off a lower area for looks and to keep animals out. The owners are thrilled with their new porch and deck. 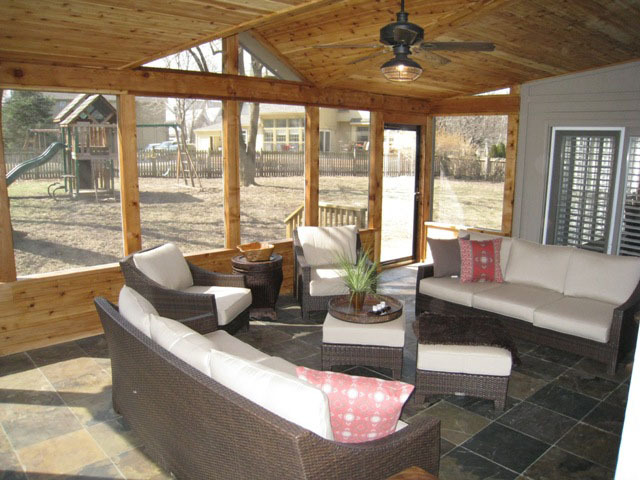 If you are considering adding a new porch, deck, or other outdoor living space to your Kansas City area home, give us a call for a free consultation. 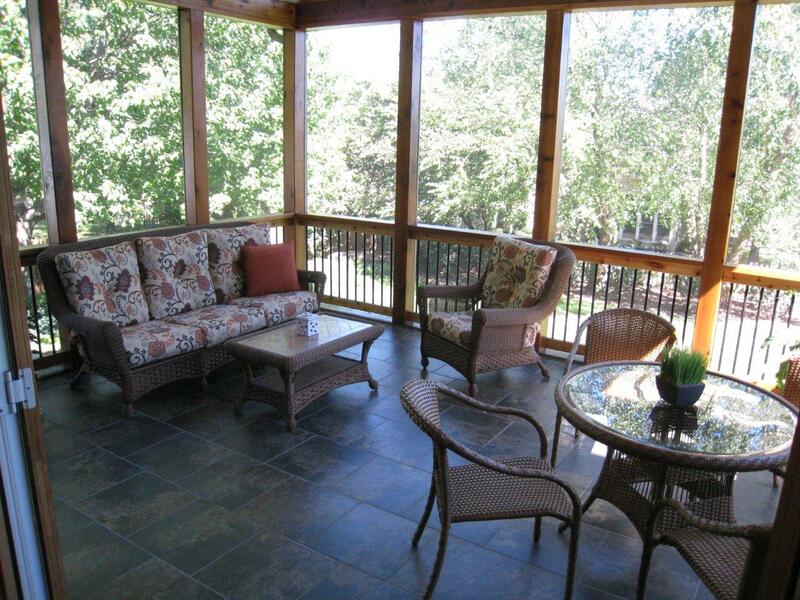 Take a look at more pictures on our website by visiting our screened porch photo gallery or our covered porch photo gallery. This entry was posted in Porch flooring, Screen Porches and tagged Archadeck KC, Archadeck of Kansas City, Kansas City porch builder, Kansas City screened porches, Overland Park KS screened porch, Overland Park porch, Overland Park screen porch on September 25, 2012 by archadeckkansascity.